Thanks for the great recipe! I have some ribs in mt freezer and you've inspired me to cook them up this weekend. Ditto on the sugar! 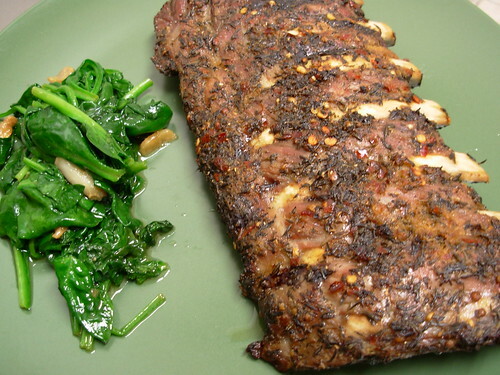 Thanks for this great recipe, I love ribs and my husband does too! I appreciate you sharing this with the Natural Cures blog carnival on healthy recipes! That looks fantastic. Just what I need for a barbeque we're hosting this Saturday. Do you think it'd work well with lamb ribs (that's all I have). Jenny - I have no idea if lamb ribs would work or not. I've never cooked ribs before in my life until I made this recipe. I can't imagine that the flavors in the marinade would be bad, but I don't know if lamb needs to be treated differently in terms of cooking time/temperature. Hey Elizabeth, I was inspired to cook up some ribs thanks to you!! I think it was the first time I had ever made them myself. I used slightly different spices but your cooking method. They were sooooo good and fall off the bone tender. Thanks so much! Incredible recipe!! Finally got a chance to make these this weekend, and the comment I received from a friend was "Wow! The crisping at the end really add something to these!" Really delicious! Thank you for the great recipe! Looking forward to trying it tonight. So hard to find a rib recipe with no sugar! I just made these today, they came out really delicious!! I only marinaded them for an hour, next time I'll try for 3, but even with just 1, they turned out great. I just made these tonight... mouth-watering! is that broccoli greens in the photo? I can't wait to test this recipe. What a unique combination of spices, thank you. Smells great! I've made this twice now. They are outstanding. I made them the first time without thyme (cause I forgot) and they still turned out delicious. I'm not sure if this was implied but I put the marinade over the ribs to cook. Great recipe!